Use of umbrellas is among the more traditional methods of publicity. The exact date of initialization of the practice is uncertain. Market umbrellas, because of their shape and ease of installation, are an excellent form of advertisement. You get to see them in fairs, exhibitions, carnivals and festivals. These are usually brightly colored to attract immediate attention of passers by and mainly used outdoors. Outdoor market umbrellas are usable all year long. Marketing agencies make use of this umbrella in uncommon ways to publicize for goods and services. The only limitation of using this product is when it is stormy or after sundown. Shoe makers, paint companies, automobile manufacturers and even private broadcasters make use of umbrellas for publicity. Market Umbrellas, when used for publicity purposes, are generally made of large or giant size to grab attention. Advertisers flaunt these in major locations, bus stations, railway platforms and community parks. These are places frequented by people from all occupations and ages. As the primary objective of publicity is brand building, the purpose is well served by displaying your company’s name on parasols and making an exhibition. 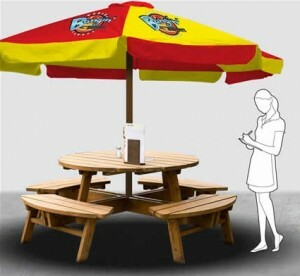 Normally, three types of market umbrellas are used for advertising purposes: aluminum, wooden, and fiberglass. Though each of these has its own benefits and drawbacks, they are used equally widely. – This is perhaps the most popular type of frame used for parasols of all varieties. It supports all kinds of fabrics and is light in weight. Although light by mass, aluminum is a durable metal and not easily weathered by natural elements. – Traditionally umbrellas were made with wooden or cane frames. They have a classic appearance and heavier in mass. Their rich appearance makes is ideal for displaying products that have timeless appeal such as period furniture or heritage homes. Being heavier, these frames are able to support weighty fabrics such as suede, satin, and velvet. – This is the trendiest material used for making frames of outdoor market umbrellas. Fiberglass being non-reactive to salt corrosion could ideally be used in all kinds of climatic conditions, particularly in locations beside the sea. Seaside resorts, beach restaurants, and coastal shanties are typical places for using such parasols. Fiberglass is also sturdier than wood or aluminum and hence could be used in windy areas.